Using barbecued pineapple, fresh lime and mint as a base, this refreshing long cocktail is tart, sweet and cooling, with smoky caramelisation from the charred fruit and freshness from the lime, mint and soda water. This cocktail uses barbecued fruit as a base to add char-grilled flavour and smokiness to this refreshing, fruity mix. More information on this technique can be found in my guide to smoked and barbecued cocktails which includes more recipes and smoking tips. 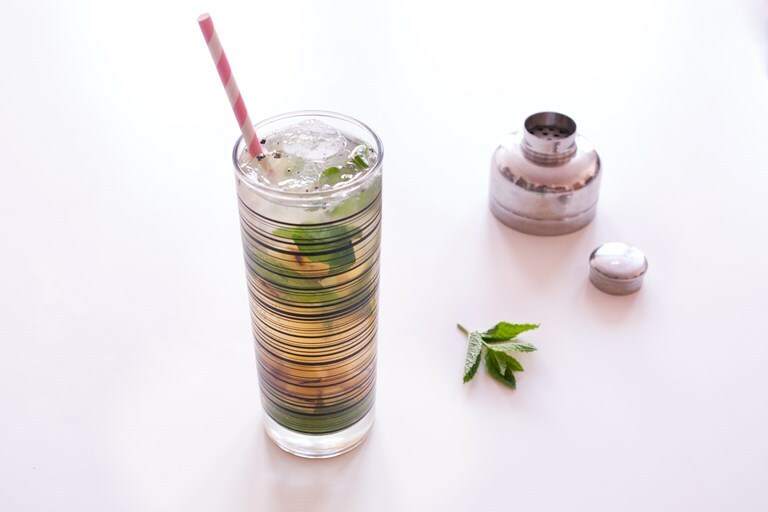 A variation of the classic mojito recipe, this drink has the same light rum, fresh mint and lime, but adds cubes of sweet, charred pineapple for extra caramelised sweetness and smoke. Lots of crushed ice and soda water make this a thirst-quenching, long summer drink. As the ingredients are mixed in the glass and not strained out, they perfume the drink as it sits and make a delicious fruity snack when you’ve finished drinking. There will be some charred flecks in the mixture from the pineapple, but this will just emphasise the barbecued element more! The strong fibres and high sugars of the pineapple make it particularly good for barbecuing. Beautiful, distinct char lines appear in only a few minutes and it releases easily from the grill. Should these flavours appeal, but you fancy a more concentrated, martini-style drink, try my Barbecued pineapple mojito royale recipe instead. The ingredients are thoroughly crushed, then strained, resulting in an intense, remarkably flavourful cocktail. If a barbecue’s out of the question, substitute a cast iron griddle pan, used on the hob. Heat the pan slowly for 10-15 minutes until very hot, then add a touch of oil before searing the fruit.